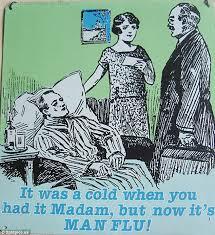 Sure, women know the pain of giving birth, but they’ve never been stricken by the Man Flu! Say you, or someone you love, is bedridden with a cold. Completely debilitated. It’s a condition affectionately called the “man flu.” Are men wimps? Or is their suffering truly deeper? Kyle Sue at the Memorial University in Newfoundland wanted to answer these questions. He compiled lab studies looking at the immune responses in male and female mice. He examined statistical trends of the flu in both men and women. He even looked at the effect of the flu in male and female human cells! RESULTS?! Men have weaker immune systems than women! Blame…hormones? Researchers have found that testosterone suppresses the body’s immune response. This could mean that HIS body is suffering more than HERS when the same illness strikes. And therefore, HIS body is compromised for longer! Rest is what the body needs to get over the flu. And it seems the Man Flu requires a lot of it. That, plus a beer and the TV clicker.